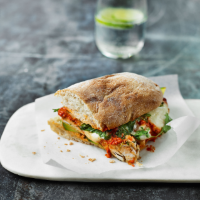 Something simple like an oven-roasted panini with melting mozzarella and juicy chicken is given a flavoursome boost from the chilli pesto. 1. Preheat the oven to 200°C, gas mark 6. Toss the chicken in the oil and thyme leaves. Cook in a large non-stick frying pan for 3-4 minutes each side until golden brown and cooked through with no pink meat. Add a squeeze of lemon juice and remove from the heat. 2. Cut each ciabatta in half to make four pieces, then split each in half horizontally. Place the avocado on the base of the bread and top with the hot chicken. Spoon over the pesto, then place the cheese on top, followed by the rocket. 3. Replace the bread tops and put on a baking tray. Place in the oven for 5-6 minutes until the cheese has melted and the bread is crunchy.